The weekend has brought along a good portion of international fixtures, as all national sides around the world look to be a part of the 2014 World Cup in Brazil. After a week with three new colourway launches from Adidas, the superstars around the world have taken to the new boots. A red boot, a blue boot and a neon coloured one in particular caught our attention. Last week we saw three new boot launches and this will definitely reflect in this round of boot spots. #TheEngine's boot Adidas Nitrocharge 1.0 has gotten a new coat of paint, the same goes for the Adidas F50 Adizero and Predator LZ II. And if the German brand was afraid none of the big stars would want to wear their new boots, then they can breathe a sigh of relief. The new boots all had a very successful debut this weekend. 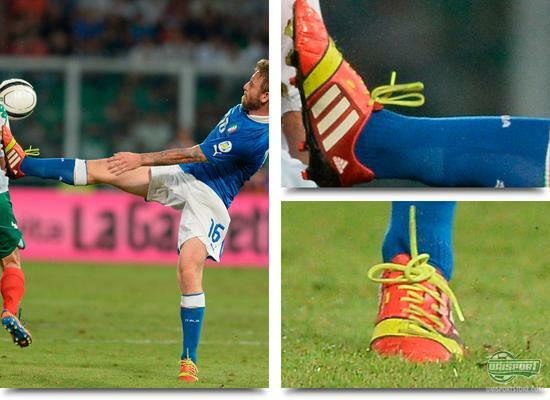 Daniele de Rossi (Italy)  Adidas Nitrocharge 1.0 Red/Running White/Electricity One of the players, who this weekend gladly pulled on the new Adidas Nitrocharge 1.0 Red/Running White/Electricity, was Italy star Daniele de Rossi. Italy and de Rossi expertly dealt with Bulgaria in usual Italian style, winning 1-0. 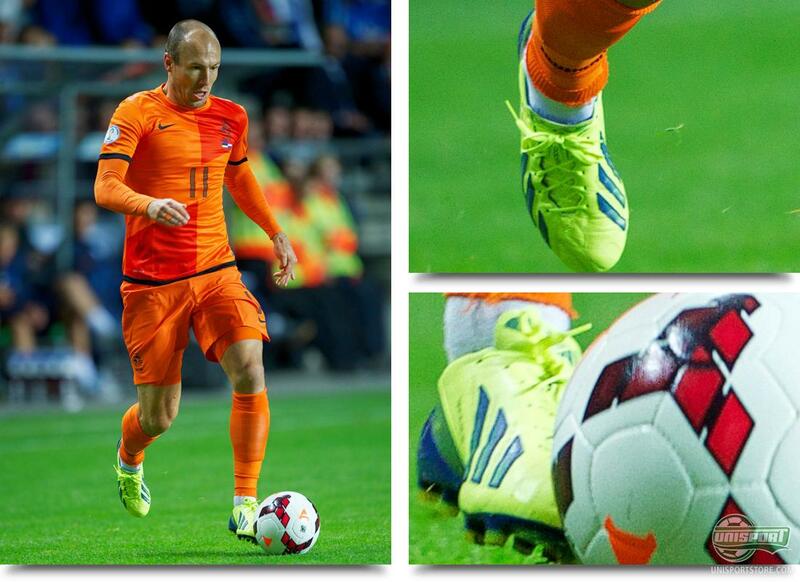 You would think Adidas are very pleased to see the Italian midfield general wearing the newest Nitrocharge colourway. 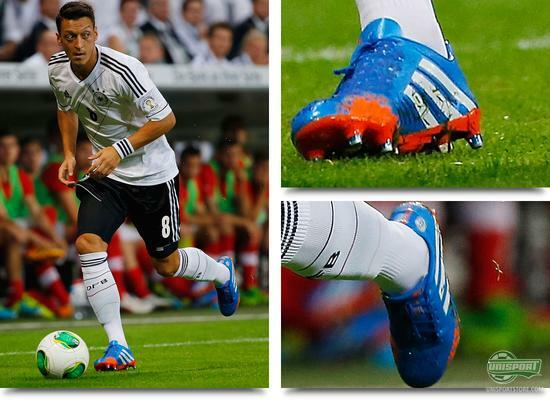 Mesut Özil (Germany)  Adidas Predator LZ II Blue/Orange/Running White One of the biggest stars, which we this weekend spotted in the new boot, is the German Mesut Özil. He moved to Arsenal in one of the summers biggest transfer stories, but he was actually also involved in another big move, when he switched brands from Nike to Adidas. In Germany's fairly routine win against Austria, he wore the Adidas Predator LZ II Blue/Orange/Running White. Gareth Bale (Wales)  Adidas F50 Adizero Electricity/Hero Ink/Metallic Silver In the category of big stars in new boots, there is no getting around Gareth Bale. 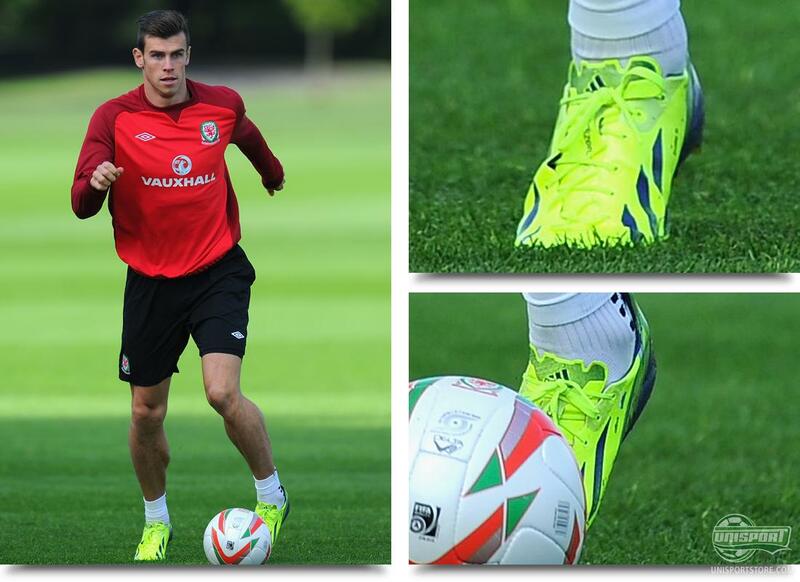 With the title of worlds most expensive player, there is sure to be a lot of attention on Bale's golden feet. And even though we got a little glimpse of them at his presentation, it is still interesting to see him wearing the new Adidas F50 Adizero Electricity/Hero Ink/Metallic Silver. Also worthy of note is that he stuck to his Trusox, which we definitely don't blame him for doing. Robin van Persie (Netherlands)  Adidas F50 Adizero Infared/Black/Running White In the last couple of games we have seen the Dutch superstar from Manchester United Robin van Persie in a specially designed Adidas F50 Adizero. 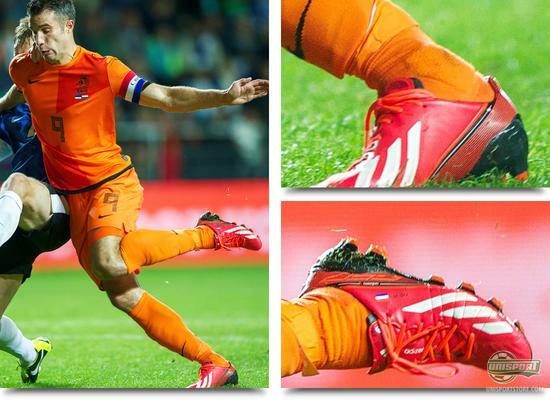 He must have left that boot at home, because in Hollands game against Estonia, RVP wore the Infared/Black/Running White version of the Adidas F50 Adizero. Arjen Robben (Netherlands)  Adidas F50 Adizero Electricity/Hero Ink/Metallic Silver An ever loyal Adidas F50 Adizero player is Bayern Munich's Dutch star Arjen Robben and he had, like Gareth Bale, switched to the new Adidas F50 Adizero Electricity/Hero Ink/Metallic Silver in the game against Estonia. It looks like the new colourway has been well received around the world and we spotted them on plenty of footballers around the world. 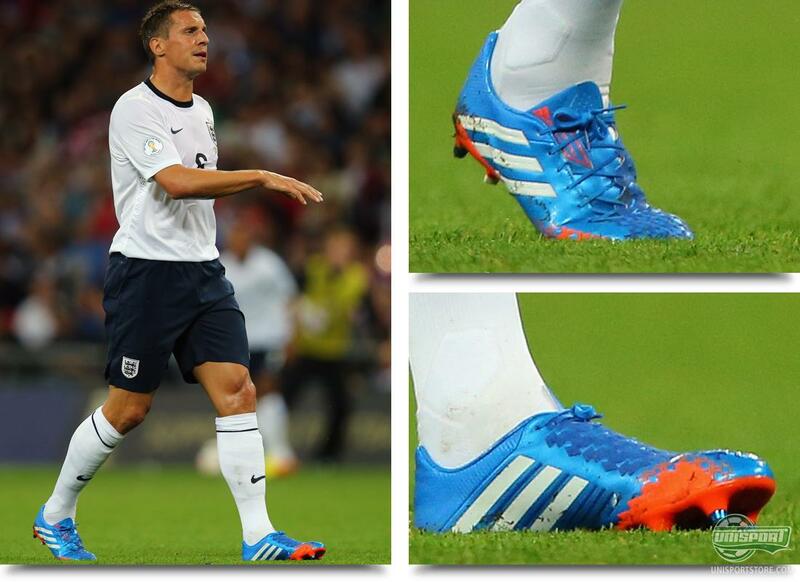 Phil Jagielka (England)  Adidas Predator LZ II Blue/Orange/Running White The new Adidas Predator LZ II Blue/Orange/Running White looks like a popular choice too. Maybe the English defenders got a bulk discount on boots. In any case Phil Jagielka, Gary Cahil and Leighton Baines all wore the new boots. Ashley Cole out on the left might be feeling a little left out, as he stuck to the Nike Tiempo Legend IV. 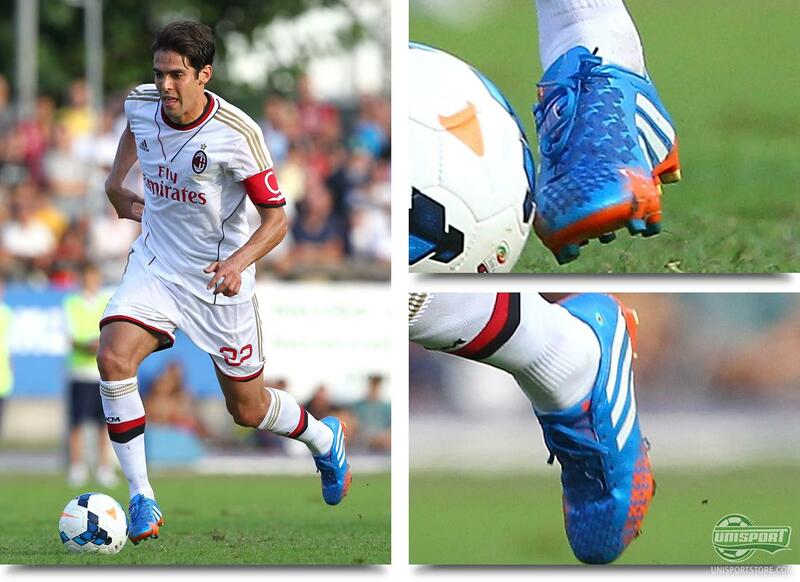 Kaka (AC Milan)  Adidas Predator LZ II Blue/Orange/Running White And just to underline the Predator dominance, we will take a look at AC Milan's new signing Kaka, who played in a friendly match. 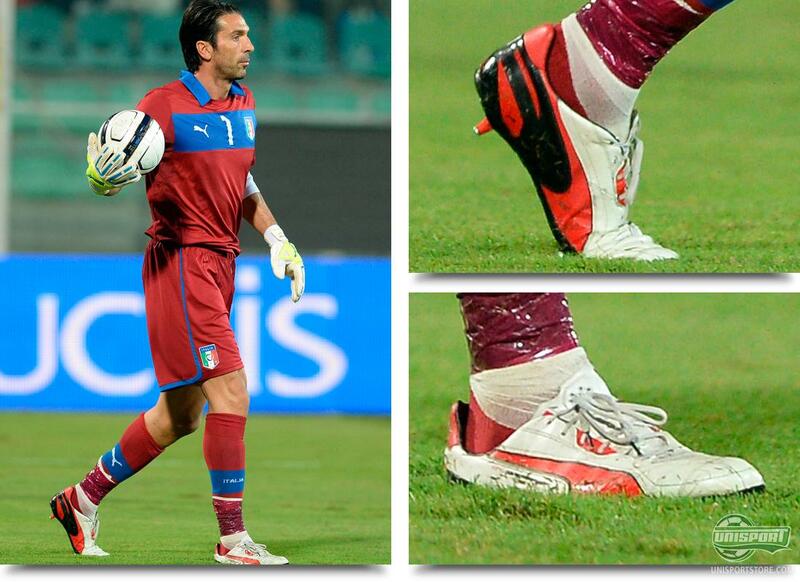 He looked very comfortable being back in the Milan shirt and his old number 22, as well as his Predator LZ II boots. Anders Svensson (Sweden)  Umbro Speciali 4 Pro White/Silver You can however easily score goals in boots that are not Nike and Adidas. 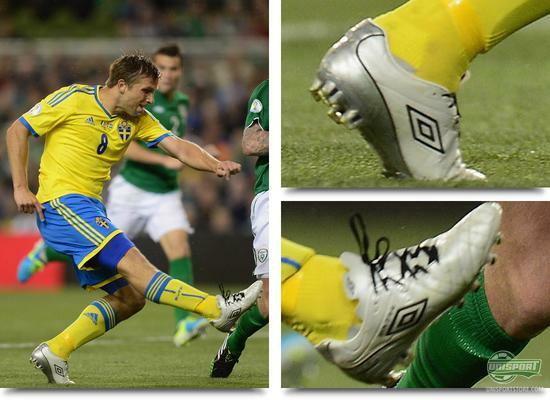 Swedens Anders Svensson managed to score, as the Swedes beat Northen Ireland, wearing his Umbro Speciali 4 Pro White/Silver. An elegant boot, which we would love to see more of. Shaun Maloney (Scotland)  Nike Mercurial Vapor IX Stealth-Pack Black/White Elegant is also the word we would use to describe Shaun Maloney's Nike Mercurial Vapor IX Stealth-Pack. We have for a while been wishing for a pair of black Vapor boots and this is exactly what Nike delivered with this summers Stealth-Pack. They were however not enough to prevent a rampant Belgium side from winning 2-0. Jetro Willems (Netherlands)  Nike CTR360 Maestri III Stealth-Pack Black/White/Orange And now we are covering the Stealth-Pack, we wouldn't mind taking a second look at Holland's Jetro Willems and his black Nike CTR360 Maestri III. 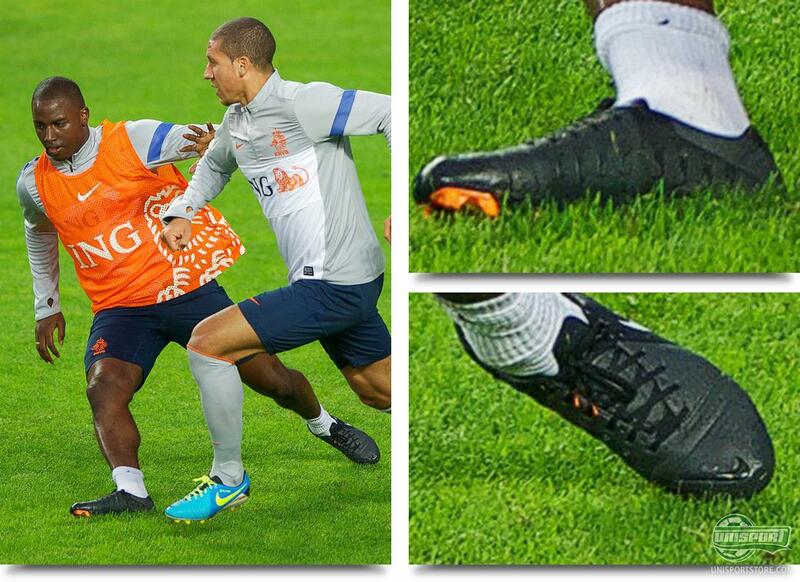 Willems has previously played in the Nike Mercurial Vapor IX, but when training ahead of Hollands game against Estonia, he had switched to a pair of Maestri III. Maybe there is a switch on the way? 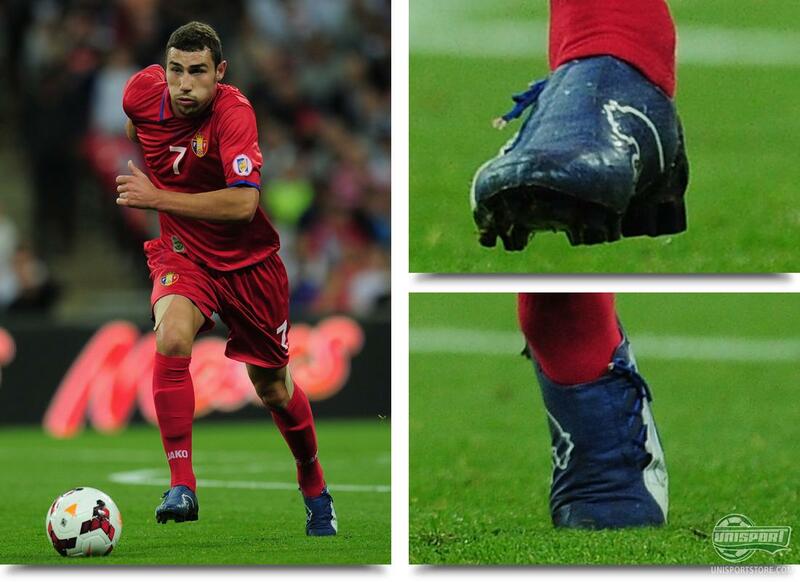 In the game itself he did however play in a pair of Nike Mercurial Vapor IX. Artur Ionita (Moldova)  Puma V. 1.06 Blue/White Here is a player, who usually doesn't get much attention, but Artur Ionita definitely deserves a moment in the spotlight, simply for his choice of boots. In the game against England he wore a pair of Puma V. 1.06, something we simply had to feature in this round of boot spots. Interesting that he would keep a hold of the Velocity-boot, even though the Evospeed 1.2 has landed. Gianluigi Buffon (Italy)  Puma King White/Red A man who is also fiercely loyal to Puma is Gigi Buffon, who is naturally always to be found between the posts for Italy. Before the season he chose to switch his Puma Powercat with the Puma King, which he wore in Italy's win against Bulgaria. Martin Fillo (Brentford)  Adidas Predator LZ SL Neon/Black/Red Some players don't like change and one of them is Martin Fillo from Brentford. In the weekends game against Bradford he wore a pair of Adidas Predator LZ SL and that being a boot we don't often see the professionals wearing, we thought that was worthy of a spot in our boot spots. Yasuhito Endo (Japan)  Umbro Geometra Whiteout The final spot on our Boot spot team goes to Yasuhito Endo. 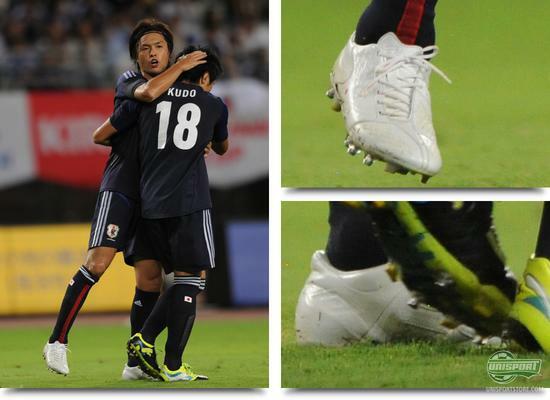 In Japan's friendly game against Guatemala we spotted him wearing a Umbro Geometra Whiteout and that is most definitely not a boot you see every day. It is incredibly elegant and maybe Yasuhito Endo can start a trend, so we may see a couple of European stars join him. We will definitely be happy to help the mission by spreading the word, with a spot in this round of boot spots. This round of boot spots gave us plenty of massive stars in the blue Adidas Predator LZ II, while the F50 Adizero and Nitrocharge also had strong showings. What do you think about this round of boot spots? Have you spotted something we missed? As always we would love to hear from you in the comment-section down below, or on Facebook and Twitter.